A warm welcome to the lawnscaping blog hop! I've been looking forward to welcoming you to this hop! You should have come to me by way of Lynette. I hope you have been enjoying the hop so far ? :) Seeing all those beautiful fall colors!? Yes, you might have already noticed that this month's theme is all things pumpkin and beautiful changing leaves: FALL! I have created 2 fall cards for you today! Both cards are inspired by the beautiful photos above. The gorgeous pumpkins and the orange colors! 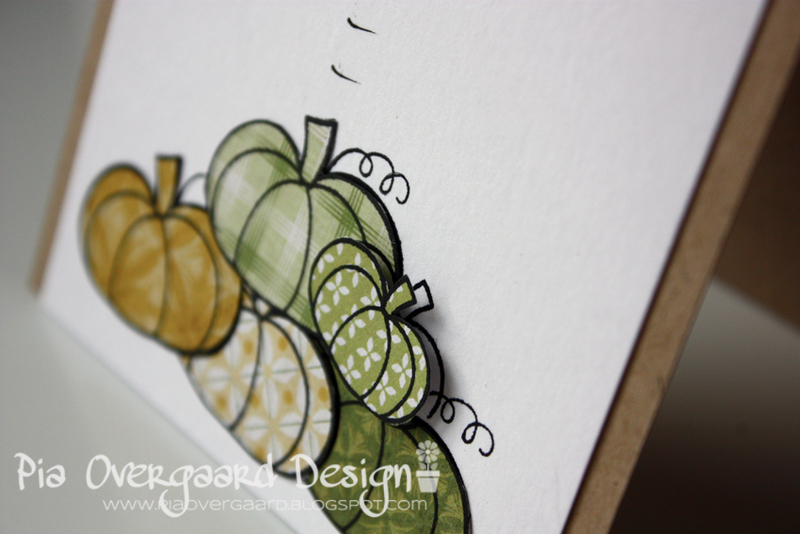 No fall card without pumpkins, right? The cute Lawn Fawn owl (winter owl) is hopping of joy to see you! He is paperpieced with some cosmo cricket papers and the eyes are black gems with rangers white enamel. Stamps: Lawn Fawn Winter Owl, Lawn Fawn So Thankful, Lawn Fawn, Lawn Fawn Claire's ABC. For my next card I used orange colors on kraft - I love orange at this time of the year! I was actually looking at the small half moon stamp in the same set Lawn Fawn Hoppy Halloween and that inspired me to create a bigger half moon (using spellbinders nestabilities) for the bunny to sit on! Note, the hop runs from Friday, October 5th, all the way until Sunday, October 7th. Make sure to comment on all of the blogs to be eligible for some FANTASTIC prizes! 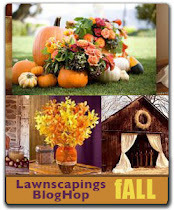 All of the details can be found on the lawnscaping home page. Thank you so much for hopping along with us all today! Now, please head on over to the talented Barb's blog. If you've gotten off-track, don't worry! Head back to the lawnscaping blog to see the complete list of designers and prize information! your projects are all so fantastic! I love your choices of patterned papers - gorgeous and fun! Oh my stars, your cards are TOO CUTE! I must have that green paper! Is that owl JUMPING on off the pumkins? TOO CUTE! LOVE that first card especially, Pia - so fun, and ALL of your paper-piecing is wonderful! pia, i LOVE the bouncy owl card!!! the colors and patterns are so autumn-y. and the vampire bunny is purty cute in the scene you've created. genius! Love your "owl action" in the firsst card. Really nice idea. Oooh, cute hopping owl and dangling carrot! Love the idea there. So clever!!! And I love the muted tones. These are super duper adorable...love them both...I want...I want..lol!! Fun cards! Love that first one more, maybe cause I have that owl too. And it's so fun to use him in many ways! Ej, hvor er det nogle cute kort. Jeg er vild med de mange forskellige mp du har brugt til de små græskar. God effekt du har lavet med stjernerne på nr. To kort. I just love your humor! Great scenes! The owl jumping into the pumpkins, and the bunny trying to catch another bunny, so fun! Love the piecing and the way you stamped those stars too! These cards are AMAZING! I can't decide which I love more! The owl card -- just fab. Those patterned pumpkins are gorgeous and I LOVE that you made some green. Totally unexpected. The bunnicula (which I like to call him, lol) card is also just incredible. You're a paper-piecing master! Love the pumpkins patterns! Thanks for the chance to win free stuff! Great use of papers. Eye-catching. The moon is fantastic! Such cute cards! Oh my goodness, I love these. Anything paired with kraft and I am a fan. Love the coloring too. Wonderful job! Oh, I love all your projects and everything about it...the colors, the pumpkins, your layouts ! Adorable! I love your cards! They are awesome! The owl hopping off the pumpkins is a great idea. So fun! And the bunny with the dangling carrot on the moon is gorgeous! I love Orange too! Such unexpected colors for your pumpkins, but i love it! Great projects. So many things I love about both cards. I LOVE the dimension, the cute images, clever scenes and those COLOR SCHEMES! The green/white and tans for the owl cards are just fabulous! I love both of your projects...great autumn color palette and so much texture! Cute cards! Love the paper piecing! I really like the way you've used mainly green in the first card. I love more traditional fall colors too, but by this point on the blog hop something that is not red and orange and yellow is sort of like a palette cleanser... quite refreshing. beautiful beautiful cards. I am in LOVE with that happy owl... my favorite card of the hop so far :) thanks for inspiring me! I would most definitely like a set of those pumpkins in real life to decorate with, they are fabulous! And your bunny card is too much fun! Both cards are fabulous! Love how you made the stars! Thanks for sharing!! I love the color combinations you chose for both -- they are beautiful! I loved that owl card--too cute! you are amazingly talented! wow!!!! both of your cards are out of this world good!! i want to hang them on my wall so i can see them always! :) i am just blown away! wow! Both of your cards are so cute! I love the owl on the first one! Two great cards, I especially like the vampire bunny one. Amazing cards, love them especially the bunny on the moon, gorgeous!! Cute Halloween card and great paper piecing on the owl card. Was confused a bit with the comment link at top of blog post. Now to comment on your wonderful Autumn & Halloween cards. My daughter & I like Owls. 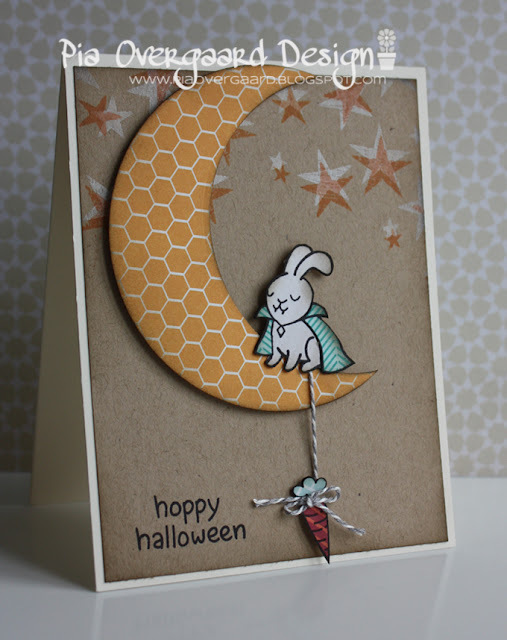 The Halloween card is whimsy with the sentiment & dangling carrot. These cards are FABULOUS!!! I love the dimension and all the little details... the owl is ADORABLE and I love all the paper piecing too!!! I am in love with your owl card, oh my goodness! How cute!!!! OMGosh so cute. Your blog has so much inspiration I had to follow you on Pinterest! Cute owl! I love all the patterned paper piecing on his card. The bunny is just awesome! I love how you stamped the stars and how the moon floats and the carrot hanging there...wonderful! Thanks for sharing! Absolutely adorable cards! Love the pumpkins and owl! Great use of the patterns papers! Thanks for being part of the blog hop! love both of your cards!! They are beautiful!! Oh my! I love both your cards! They are so unique. Love how you achieved motion with the owl and the gorgeous warm pattered papers you used! And the stamping on the 2nd is so fun, love the double stamped stars. And that moon with the bunny could not be cuter! Wow! Your cards are just stunning! Amazing paper piecing! Love everything about them! Great job! What great cards! I LOVE the colors on the owl card! TFS! Beautiful cards! I really love the one with the owl! The paper piecing is great - love the choices of paper! I really love your non-traditional take on the colors of fall! Wonderful, fun designs! I love your bunny card! Very creative how you tied the carrot with it too! Thank you for sharing! Such great cards! I love the jumping owl =) TFS! Both of these cards are great. I love the inspiration to take a stamp from the set and use a due to mimic it. The papers and colors on the owl card and the black gem eyes with white enamel is genius! The patterns on your pumpkins are perfection ... adorable little autumn owl too. Great cards! Love the fun owl and paper pieced pumpkins! Love both cards! Your patterned paper choices are perfect, love the jumping owl and the cute rabbit with the moon. The double stamped stars look amazing! Love them both! The paper piecing is superb and the non-traditional colors, gorgeous! Both are so cute. Like the dangling carrot. Very creative way to make the owls eyes. Like the idea of adding the white on. Your two cards are so adorable! Love the bunny's cape and the huge moon! These are both so very super cute!!! !